I want to thank you for our Malinois, Varg (Ivo x Ebee 04.21.17), who will be turning 2 years old in two weeks. He is an absolute pleasure to own and work. Varg is obedience trained and we are now engaged in protection work. 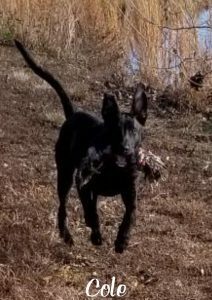 (Kudos to Bill Woodard for the professional assistance) Ever since he was an eight week old puppy, he has displayed incredible prey and food drive. This drive has made his training much easier than I anticipated. Now at 80 lbs., his bite work is great—hard hitting and tenacious. He is an unbelievably athletic dog…there is just no such thing as half way with him. From chasing a ball to working with our agitator it’s all 100% effort. Despite his drive and naturally protective instinct he has a wonderful temperament; loves everyone in the family…especially the grandchildren. I’ve included a picture of him below. So once again, thank you, Ted. I’m sending a few pix of Pahili (Cody II x Iggy). We are having a blast with him – lots of energy, very smart, and bonding really well with. I’ve taken him a couple of times to a friend’s back yard agility course & his favorite was the tunnel with a sleeve. He’ll try just about anything & is very focused when he gets his mind set on something. He’s learned lots of basic commands that we’ve taught (plus a few things we didn’t teach, like it only took him about a week to figure out how to open the sliding screen door in one swipe, then had the gate latch figured out last week, so we keep adding layers of security to his play yard). Once he gets his 3rd set of shots next week we’re looking forward to getting him out a lot more to work on obedience with more distractions. Our 5-year old belgium, Heidi, has been a great big Sis – very patient most of the time and likes the company. Hope all is going well! I just thought I’d let you know that Havoc (Ivo Iedema x Ebee van Younghaus) is doing awesome and is full of confidence. He is 16 weeks and 45 lbs, he is going to be a monster. The trainer we are using here on Oahu says out of all the years he has been doing protection work he has never had a dog so young hit so hard and show so much potential. Mahalo on placing me with this pup I couldn’t ask for a better companion. Hachi (Cody II x Nalu) has just turned 9 months. Weighing in at a lean 68lbs. he is quick and agile. He seems fearless, and is confident in any task. He has been eager to train since we received him at eight weeks of age. Quick to learn Hachi unfailingly performs all learned and new jobs. If there has been any failing of his training it would be attributed to my shortcomings and not his. He is strong on the trail, high jumping and scaling rock faces. Hachi is also an outstanding and confident rough water swimmer. He fearlessly challenges the shore break here on the north shore of Oahu. He has trained to rescue and return swimmers to the beach. Hachi has become my constant and attentive companion and does not let me leave his sight. He is protective of my family and property and is a credible watch dog. He works well both on and off the leash. He is also well socialized with people,other dogs, cats(they helped trained him) and chickens( took a little more training). Despite his size, strength and energy he can be a “cruiser” and enjoys being handled and takes big hugs from admirers. Hachi has a lot of dimension. Ted I absolutely love this dog. I had high expectations of the Malinois which have proven to be surpassed by this fine animal from Younghaus Working Dogs. Mahalo for matching me up with Hachi. 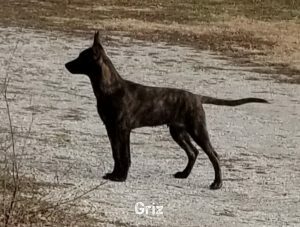 I wanted to be sure to contact you so I could provide an update of our pup Kileona or “Kili” from the Younghaus ‘K’ litter sired by Cody II out of Nalu, Aug.28, 2015. We are very impressed with the quality of your dogs, their inherent intelligence and work ethic. You have truly beautiful Belgian Malinois and Dutch Sheperds, and it is clear that you are devoted to providing excellent training. We have a 5yr. 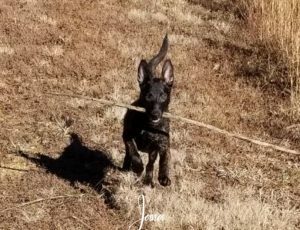 Belgian Malinois, “Mele” and wanted another dog to serve as family member, a companion for her, as well as home protection around our property. We got that and more! Kill is amazing!! He is now 7 mos. old and hands down the best dog I have ever owned. He is absolutely stunning in looks and extremely intelligent. I have never had a dog that was so quick to learn, so intelligent and so loyal. Since we do not live on Big Island, I took your suggestion to follow up with trainer Scott Sanchez here on Maui. I believe he incorporates the same dedication to these beautiful dogs as yourself, and Kili thrives on the learning and lessons. He works off leash, learning obedience, positioning, recall, and various commands that we incorporate into our daily routines at home, working with my horses and every other aspect where obedience is appreciated. He is very quick to learn, and has excellent ball drive which we utilize to facilitate his training, and he thinks of it as all play! He is very loyal, and constantly keeps me in his sight. We are now working on jumping obstacles by command and he loves it. I look forward to advancing his training as much as possible as he takes it in stride, truly excels and it is so rewarding! Also along the line of protection, the combination of Kili and Mele makes for a formidable watchdog presence around our property! I just wanted to share the accomplishments and pleasure your pup has brought us. Thank you Ted, we’ll keep you posted!! the whole curriculum in basically a day it was designed to be a six week program. Brownie this dog is stunning and a credit to his breed and breeder. similar kinds of Shepherd dogs, this dog is on another level. stating that you think you found the pup for me, I couldn’t wait to meet him. time and dedication into making the perfect working dog! Just writing to let you and other people know about how pleased we are with the purchase and importation into Australia of our new pup Chevy , (16 week old Male pup from a Storm an Nalu repeat breeding ) . In the short time Chevy has has been here with us we have seen fantastic nerves , nothing bothers him at all , he will chase a tug on a slippery tiled sufrace , run up an down stairs like an adult , stays focused on me with great ditsractions from other dogs and loud noises , he has great drive for food and will hunt endlessly for a treat . I could go on and on about how great I think this pup is , everything I see in him leads me to say that he will be an awesome dog when he matures. A pup must have to have extremely good nerves to have to go through the long flight times and quarantine processes that Chevy had to do to come into Australia and not have any of his drives flattened throughout this ordeal. Well let me tell you Ted, anybody else who wishes to purchase the Dutch Shepherds you are breeding, that they will be very very happy with what they get as we are extremely happy. Chevy has everything and more that you would wish for from a good KNPV breed Dutch Shepherd and to back this statement up while Chevy was doing his time in Sydneys Eastern Creek Quarantine station we had Craig Murray a Sydney based trainer who trains with and supplies dogs to the Australian defence forces attend the station on four occasions to test Chevy for us. Craig was extremely happy with what he saw in Chevy and has told us that he ticked every box . His nerves are extremely good and his drives are as good as it gets . Thanks Craig and thank you Ted, everything you did for us to make this happen was very easy and it has been a pleasure doing business with you. We will definitely be purchasing another pup from you in the future. Well I have to say it couldn’t have gone any better if I had told the pup what to do. EVERYONE loved her. The flying didn’t phase her at all. When I got her from baggage she was happy and ready to play. We headed up to Kahuku which is our training site. She met everyone and explored everything. She climbed in all the tubes she could get to and climbed on everything that she could reach. We even did a runaway with someone she just met and she ran right to him, on a bus no less. She walked on the huge rock pile we have, carefully picking her way across it. Very confident in her steps. We went to a friends house and she played in their yard with a 9 yr old border collie, tugging with her and also tugging with toys with 3 different people. The next day we went for a walk in Honolulu. She was a little cautious here so when I saw she had had enough I just carried her the rest of the way. We sat out side at Starbucks and she just sat in my lap looking at everybody going by. Not a care in the world. We then headed over to State Civil Defense and she got to meet and play with 4 of the office ladies. They again LOVED her. She was so cute, she would run to one of them, climb in their lap, then take off to someone else. She did this for about 1/2 hour. She did have the maligator snap going on so I had to make sure they watched for that. She explored everywhere we allowed her to go. We then had to go to another meeting with all the heads of Search and Rescue from all the islands. I put Ka’imi in her crate in the room with us and she either slept or just chewed on her bone for 3 hrs. They were all highly impressed. After that we had to get ready to fly back so I took her to a park to walk her around. She had to go up a big flight of stairs and pass 3 big guys. No problem. She walked the park like she owned it. Again jumping up on everything that was her height. She even went on a huge grate that was covering a 20 ft. hole. It didn’t even phase her at all. When we got home, again the flight didn’t bother her, I took my suitcase out of the car to bring it in the house and she thought it would be a good thing to attack. She grabbed it hard and pulled and tried to shake it. She was still full of energy!!!!!! So as you can see it was a GREAT two days. She was exposed to so much but nothing bothered her. EVERYONE can’t wait for me to bring her back. excellent Search and Rescue partner for me. Thanks again for such an awesome pup. Just wanted to thank you both, again, for Kauila ( W litter Carly X Ness) and the obedience class. felt like she became an attachment at my knee. Gia was able to walk her, too. We had FUN! and Gia and I can walk her there. Thank you so much…you have brought JOY into our doggie life. I saw on your website that you have some other pups coming soon. You are gonna have your hands full!! That is so cute of you to mention her beautiful tail. (Hazzie Aussie Puppy)I love their happy full wagging tails. Thank You for your response and kindness to her eager mother!! I will have great things to share on your website about your business and what a great attitude you have towards your customers! As you know, deciding to bring a dog into your care is a big decision. However the joy that they bring is priceless. Can’t wait to see her. Thanks again! Shepherd to our family we know where we will go and that is to you. Thank you. easy going. He is, of course, acting as a puppy… happy and explorative. now sleeping right next to his crate. All in all, I am very impressed! they are looking for a great GSD. worry about her. We will bring her back when we travel in the future. I just wanted to share a picture of our two beauties Saigon and Kanani. Saigon is a special girl she has been Daddy’s girl from day one. She joined this family after being loved and cared for from you and your family for her first 4 yrs. of life. We invited her into our home not knowing what to think. She must have known right away we didn’t need her but we wanted her as apart of our family. She came right into her new home and excepted the change the cats the children running around Mommy going crazy and Daddy in and out. I must say I had doubt at first bring an older dog into the home. If there is any doubt in anyone’s mind about taking in one if your older dogs, I can only say do it! She has been so full of Love and dedication not to mention completely trained. We have had her 4 years now and she is truly this families best friend. We enjoyed her so much we knew we wanted another one and that’s when we saw the face we loved and new right away she was the one. Kanani, Now she is Mommy’s girl. I thought oh no we never went threw the whole puppy training thing, but I must tell you it was like she was never a puppy. She never chewed a thing but this big big big bone bigger then she was she was given the day she got her with the help of her big sister. Able to stay home with her made it easy to potty train every 20 mins we went outside and before going out I would go to the door and bark until she barked back. A few weeks of that and she was on her own going to the door and letting me know she had to go. Of course she would spend time in the kennel if we went somewhere and threw the night. The funny thing is we have a lever on the door and the smart dog she is opens the door to let herself out now. Kanani is a joy she keeps Saigon on her toes and keeps her young. Just short update on Cienna (Q litter Falko x Zango)@ 5 months she is 53# and very lean. Still doing the same basic obedience, now with a running Platz and Steh both off and on leash. We have been using the ball and giving a treat on the Brring and her drive for the toy is very high. She is doing the intro bite things on the burlap sausage on the Packen command. She knows the Aus for everything from the rocks she likes to the toy. Still no tracking started at all. She does all the obedience with Celia very well. We are just turning the corner with her jumping up on every greeting. I bring her into stores and everything generally goes very smooth, she wines and barks when she sees little kids. Still very excited with other dogs but plays after a good 15 minutes of posturing and heavy barking. Shows extreme guarding potential around the house and always lets us know when someone is approaching. Good contact with friends when she sees everything is calm Sleeps in the crate every night and is in it when we go out. Just thought I would drop a line to let you know how the dogs are doing. They are gorgeous animals and are behaving perfectly. I am on ship until September and have been gone since June, but Estrella continues to work with the dogs. She goes once a week to the military police kennel master to train them. He was the kennel master for the entire department of defense before arriving in Hawaii. He is very good and passionate about dog training. He has helped us bring these dogs a long way towards our goal of having 2 schutzhund 3 animals. He is confident that they will both make it though. Phantom (Falko x Terra) is 90lbs at 7 months old. He was just weighed. Onyx (Prandy X Zoya) is a solid 60 at 8 months. We feed them Solid Gold dog food and it keeps them very healthy and energetic. They both have such a great protection instinct and it gives Estrella great peace of mind while I am gone. They don’t allow anyone to approach until we give them the ok. They now sit perfectly with great form after a few pointers from the trainer and we are working grip with them as well. All the military police dog handlers that have seen Phantom are amazed by how massive this dog is. They know he is a puppy from looking at him, but can’t believe his size. Some have asked if he was part St Bernard. I feel sorry for the person who has to wear the bite sleeve for him. His bite is deep and extremely strong. The trainer says his bite is deeper and stronger than most of the MP dogs in his kennel. You would be proud of how these dogs are doing. Let me know next time you guys are coming to town, as I am sure that you will realize what great animals we have and furthermore, keep peace of mind that they went to a loving and caring home. What can we say except another great job once again from ALPHA K-9. (Vom Younghaus) This is now our 3rd. Family Dog from you. Starting in Hawaii with Kanani & Saigon (Dax x Zoya) and now Guam with Rain (Jago X Basia). These dogs are Good Tempered Healthy and just Fantastic Looking.. And when people ask where did they come from? We are proud to say from your Island to ours. With a WOW response. Vance, Hunter , Logan and I would like to say Thank You. Thought I’d check back in, let you know that Maile is doing wonderful, she is an awesome addition to our home and we are so pleased. She is a feisty little one, full of lots of energy and keeping us on our toes…I thought our goldens were smart, but nothing gets passed her. After long deliberation, we have decided to spay her…we never considered breeding her, but I am very concerned about surgery and more importantly her recovery time…she is so active, jumping everywhere, that I just cant see her resting to heal….but I know it’s the responsible thing to do…. (Q litter female Mouser.) She’s already getting better with the cats! She doesn’t bark much at all anymore at them and just runs towards them a little. She’s Greg’s little shadow. We are building a house on our property and she follows him around all day long. If he goes up on a ladder or walks away, she starts to cry. Everyone who has met her is amazed at how well behaved she is. I would like to put QD Pea on her papers. It’s me, Jodi Sasaki, owner of Koko (female shepherd, born April 1995). I am going though some old documents and came across our original invoice for our first dog Gigi and thought to get in touch with you. I wanted you to know that although ‘an old lady’, Koko continues to be a wonderful companion for our children and great security guard. She has enriched our lives in ways that I never expected and as we move towards her golden years, enjoy her excitement, even though she has arthritis. I( Ed Engel-from Maui) purchased a GSD from you in 2004. A Female, Sable, born 6/6/04, from a “D” litter. I believe we spelled her name “Dodee”. The reason for this E:Mail is that I am unable to read her tattoo, and need this info to renew her dog license. So if you could please check your records and get back to me I would be most appreciative. Just to let you know……Whitney(that’s the name we chose to call her by) is the sweetest tempered, loving, and bar-none the most LOYAL dog ON THE PLANET!!!!! That is; to all our family members, and other pets. However; she is very protective of her family and our property. When I’m home, she is my shadow, otherwise she shadows my wife, and if she’s not home, she follows my Mother-In-Law around. She’s REALLY smart; you can actually see it in her eyes when she is figuring things out. She always minds, is very active, and of course……………is ALWAYS so happy and overjoyed when anyone of us returns home; even if we’ve only been gone a short while. She also enjoys giving doggie kisses to any and all who will let her. And I say that dog saliva is better than any medicine, doctor, or shrink! Thanks for sending Onex (Prandy and Zoya 2006) to us; she is perfect for our family. She is also the smartest most trainable dog I have ever seen. She slept through the first night, waking us up only once to take her out. She never cried in her crate. The second night, she woke us up twice. So, she was waking us up to take her out since the first night home. After the the second night, she has slept all the through every night without incident. I attribute this to the breeding conditions and prep work done in advance of sending her here. I really think separating them at 7 weeks was the key to her succesfully blending in perfectly on her first night. In her first 2 weeks, she has learned to eliminate on command, come when called, sit, lay down, and sit before entering or exiting doors. She is a breeze to train. Her prey drive is crazy too. She stalks my wife and me constantly. She chases everything in sight with enthusiasm. As soon as we finish her shots, we are joining a Schutzhund club in order to bring her to her full potential. We can’t wait to get Phantom from the “P” litter. I know you will put in the same work to have him fit in just as nicely as Onex. A friend came over the other day after he just bought a dog a couple of days before. After seeing Onex, he returned the dog and will be purchasing a dog from the “P” litter as well. Once he saw her crouch down and stalk me, then lunge at me when I ran at her, he made up his mind. Most 8 week old puppies wouldn’t have that kind of drive. Thanks for a companion who will be with us for years. You may use me as a reference if you would like. I would gladly speak with anyone concerning my experience with Vom Younghaus. showing a high level of intelligence at only four months. We also have a 8 month Belgian. I am interested in taking classes so that I may better train both my dogs. I do not know if you offer this type of training. I have only recently discovered schutzhund and I am very interested in learning to work with my dogs to their full potential. If there are any available classes, like I have described, I would be very interested in attending. I would like to know prices for something like this and how I can get started in this wonderful sport with my dogs. Also when is the next available board and train date and how much would the total cost be for one dog for 28 days? Any and all information you would be willing to give is most appreciated. Thank you once again for the wonderful puppy. Layla Vom Younghaus is a remarkable animal and quickly taking my heart. We currently own Sir Wolf Vom Younghaus who will be turning 9 years old on June 16. We adopted him when he was 1 years of age from a gentleman who could not care for him, due to an extremely hectic work schedule. Wolf is the absolute best companion we have ever had and we are interested in adopting another black GSD. Wolf has an outstanding disposition, temperament and is just an unbelievably loveable dog. Can you please let us know if there are any plans for another litter that includes all black GSD puppies? If so, when do you expect the litter? We are interested in another male. Dasko at 19 weeks is doing great. He is a fantastic puppy, such a fast learner and so willing. His focus is phenomenal. We are working on Schutzhund Obedience and it almost seems as if he already knows everything. He has worked a few times in puppy protection and by the second time he was barking and biting like a pro and carrying the rag back to the car. We have also been busy with socialization and he is not afraid of anything. Jack hammers on the street, loud work trucks grinding up cement, joggers, rollerblades, people walking, etc., he is interested but not alarmed. We are going to a puppy class at the local SPCA to give him some experience. He gets lots of compliments, everyone is impressed on how focused he is and how fast he learns. Also by how handsome he is! At 13 weeks his ears were up and he started getting permanent teeth at 17 weeks. He is very active. He herds other dogs. He has inherited a strong herding drive. I am enclosing a few pictures. We are extremely happy with him and feel very fortunate to have such an exceptional puppy. Thank you both for breeding him and for letting us have him. Thank Zoya for producing him and caring for him for his start in life. We love him very much. Here is a handsome photo os “Duke” when he was a year old. We think he is so handsome and intelligent. (Dax & Diamond) We love him to pieces. Don’t know what we’ll do with out him. He is such a great companion, goes everywhere with us. He likes to ride in our convertible Jaguar and Mercedez, loves everybody. Thanks so much for connecting Duke with us. Here is a long overdue follow-up on Fendi. She is now 10 years old out of Ork and Gala. This is the nicest German Shepherd, in fact the nicest dog we have ever had. She is just plain sweet. Very smart, remembers her training. We live on a dead end road and she just “hangs out”, doesn’t go anywhere except a few 100 yards to the beach. She still chases sticks to exhaustion. Started acting a little more senior citizen 6 months ago, but is ready to do for a ride or walk anytime. Had her fixed years ago. Essentially she has never been sick. AMAZING. Just plain nice dog. Enjoy the photos! I just had to call you today to thank you for selecting my family the most exceptional dog! Bambi Grace vom Younghaus (born Feb 14, 2004) has exceeded the expectations I had when I bought her at 8 weeks of age. Since the day we picked her up at the airport in Kauai, she has been a joy. She is so much fun, learns so quickly that at 6 months of age, she goes out surfing with me! I really need to get you a picture of us! She is so intelligent that she is on and off leash obedience trained already and always looks to me to do more! She is 64 solid pounds and has substantial bone. I want another one!!! “Z” Zodi. (Prince x Nicki) Hey guys! It’s been a while since you’ve heard from us, now here in wonderful central Virginia. Zodi is incredibly fast and flashy, and typically completes courses at 1/3 to 1/2 of course times. We tend to have fast, clean runs and first places, or we don’t qualify at all. When we don’t qualify, I can usually chalk it up to handler errors. Besides competing, we have joined a newly formed agility demo team, which is going to be doing very flashy and entertaining routines with agility equipment to music. We also participate in agility demos whenever the chance arises. A few weeks ago, we did one at an International Polo Match, and we did a mini weave pole challenge. Zodi did 30 weave poles in 8 seconds. She is incredible. You guys would be amazed if you met her as she is now at 5 years old. My intensive investment in her as a companion and working partner have reaped untold rewards. Her vocabulary and ability to communicate amazes everyone who meets her (and I’m talking about very experienced trainers and coaches). She is incredibly interactive and able to seduce anyone to play with her, even those who don’t typically like dogs. When we run at trials, I get nothing but compliments, awe and envy from the other competitors and audience. She knows every pet trick in the book, as well as many I’ve come up with on my own. She is an amazing animal, and truly, is my heart. I have learned so much by raising and training this girl! I am no longer the absolute novice you met 5 years ago. I’ve come to believe that in raising her, given her drives and character, I’ve gained much more than the equivalent of raising one dog. I know that I will do even better with my next dog, which is almost hard to believe given what an incredible dog she has become (a lot of this has to do with the fact that I will be much more prepared to deal with the drives and nature of such a pup, and won’t make some of the mistakes I made out of ignorance the first time around). Now that I have created the most wonderful dog I could imagine for myself, I plan to enjoy the results of this for as long as she’s with me. I’ve been doing a lot of thinking about my next pup, years into the future as that may be. I consider Younghaus to be my breeder, and I can’t imagine getting a pup from anyone but you guys. That said, when the time comes, I will do a lot of talking with you guys to ensure that you once again will be able to select the perfect match from an appropriate litter for me. I’m guessing that in any litter, even with the consistency you guys manage to achieve, there is variation in drives, and it may be possible to come up with something in this range. (Alternatively, even with similar fight drives, I now know much better how to deal with that, and believe I could do so if necessary, when the time comes.) After we’ve completed this competition season, I’ll email you with our earned title’s). Thereafter, I’ll probably do so after each season. I visit your website from time to time, which continues to improve, and I love being able to see pictures of your lovely children. They sure are growing! I hope all is well with you guys in lovely Hawaii. Zodi sends greetings…L. Merigian. “T” Duke” (Dax x Diamond) “Duke has been with us for only a month and it seems he has been with us all the time. Adopting Duke has been a fulfillment in our lives. He is smart, clean, intelligent and a wonderful companion. He definitely comes from a good breed because he is fun and made a connection to us as soon as he arrived. He responds when we call him and has never left our side or sight since he came to us. He sleeps through the night with no problems next to our bed in his own little bed with an old T-shirt and a chew toy. We would not trade him for anything in the world. “Schatzi (Dax x Zoya) is doing great! She is alert, focused, intelligent and a quick learner. She is now 12 weeks and 5 days old. almost desperately!!! I just can’t wait to get home and hug him. And the vet thinks he’s just wonderful too. Our Schutzhund training is on vacation for December. We’ll go back in January. “Heidi (Prince & Penne, 5/16/99) is known here at home as Lilly. Lilly lives for the ball and her squeaky rubber hamburger. ” She has a wonderful, sweet spirit. She is fiercely protective of me in particular, and is social, yet reserved, with strangers. I believe Lilly not only brought joy to her “parents”, but her “sister” Saydee was able to be weaned off medications she had been taking for two years for hip and digestive problems. Saydee has not had any episodes since, and is in perfect health. It is my feeling that Lilly is responsible for making Saydee a happier, healthier dog. It is because of the total satisfaction we feel about our purchase of Lilly, that we are contacting you regarding the purchase of another dog. “Jin” (Omega x Zoya) is doing VERY well and has tremendous potential as a working dog. He lives to play ball and tug the leather rag (at this point he barks, bites with a full grip, and carries nicely). He is also heeling like a little pro for the ball. We have been daycaring him once a week to keep him exposed to new dogs, but he has proven to be a little to dominant for his own good- he refuses to submit to other adult males and has rapidly mastered the art of leg lifting and marking when in their presence. Anyway, just wanted to let you know what was up and say hi.